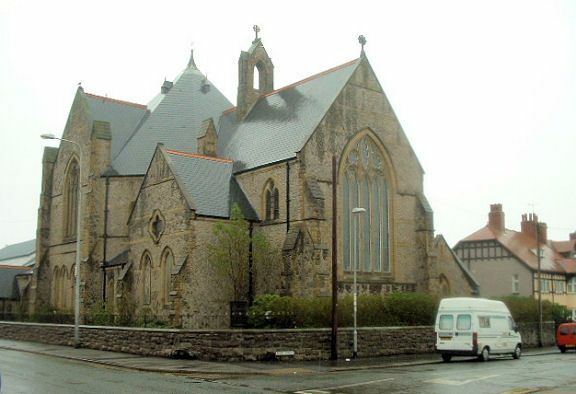 The church had its origins in a congregation which was meeting in a school, and in the skating rink of the nearby Winter Gardens before the church was built in 1885. The architect was David Walker of Liverpool. Random rubble stone with freestone dressings; slate roofs with red tile cresting and coped gables. Octagonal roof over nave, with leaded lucarnes and fleche. Bellcote on chancel roof. Unusual plan with octagonal nave, from which project at the cardinal points, western narthex or ante-nave, transepts with clasping buttresses and chancel, linked across the angles by single storeyed lean-to bays. Organ chamber and vestries to N and S of chancel. Arched entrance in gabled porch projecting from lean-to S aisle of western narthex. Arcaded lancet windows in transepts, with wide 4-light decorated window above, and stepped 3-light clerestory windows in angle blocks and western narthex which has 4-light plate traceried west window. 5 light Decorated E window to chancel and high-set plate traceried windows to the N and S. Paired lancets with quatrefoil over in gabled organ chamber to S.
Large open nave with octagonal roof. Western ante-nave is articulated by single arches to N and S, and a canted 3-bay arcade divides it from the main body of the nave, with high central arch sprung from corbelled wall posts, and lower arches on polished granite shafts straddling the angles with the transepts. Inserted low timber screen now separates the western bay from the nave. Like the western arch, the chancel is sprung from corbelled wall posts, and also forms the central bay of a canted arcade with lower arches across the angels with the transepts. Ribbed octagonal roof over nave surmounted by open-work timber lantern, the ceiling boarded and panelled, and the main ribs carried on wall-posts. Coved ribbed and boarded roof over chancel. Oak panelled reredos originally at Saint Thomas’s Church. Open-work panelled wood pulpit on stone base, c1890. Mosaic floor to chancel. Stained glass in E window by Goddard and Gibbs, 1970, in NE angle of nave, of 1932 by Christopher Charles Powell, and SE angle of 1906, by Alfred O Hemming. SW window, and W window of 1886 similar to Hemming window, but unattributed. Unusual light fittings in nave are cast-iron standards with scrolled decoration, and straight brackets carrying lights. A striking and unusual design, perhaps conceived to provide a large and open plan for a church built to serve a rapidly growing area. Sited at the far W end of the long up (N) platform at Rhyl Railway Station.